WHEN the "last chance to save the Earth" came around in 1992, the global environment and development community was full of hope, energy and expectations. Ten years later, another such chance is round the corner, but nobody is getting his or her hopes up. Commentators around the world have remarked on the lack of enthusiasm and preparation for the World Summit on Sustainable Development (WSSD) planned for late August 2002 in Johannesburg, South Africa. A lot more preparation preceded the 1992 UN Conference on Environment and Development held in Rio de Janeiro, Brazil. In Asia, many view the meeting as just another political circus coming to town. Cynicism was apparent at two meetings held in the region recently - one was a meeting of non-governmental organisations (NGOs) from South Asia held in New Delhi, and another was a high-level regional meeting on WSSD, held on November 27-29, 2001, in Phnom Penh, Cambodia. At both the meetings, NGO participants wondered if they could actually hope to positively influence the political outcome. Their previous attempts to push for a fair, just and equitable framework for managing the global environment - whether at Rio, or the climate negotiations, or any other environmental negotiation over the last 10 years - have failed, as industrialised countries hold the trump cards, but are not worried about ensuring a democratic outcome. At the New Delhi meeting organised by the Centre for Science and Environment, an NGO, the lack of faith in the global process was mirrored by a lack of faith in the national process. 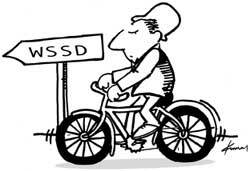 A review of the Indian government's plan for WSSD made it clear that at least so far, there were no proactive proposals. Only a list of problems has been identified. This lack of initiative in finding concrete solutions is part of the reason why national concerns of countries such as India remain unaddressed at the global level. Southern governments arrive at global meetings without any concrete proposals and options to table, and simply end up giving in to proposals by Northern governments. At the Asia Pacific level, governments negotiated a 'common platform' for the WSSD - in a manner designed to kill the remotest possibility of creativity in seeking solutions to promote sustainable development. Delegates were issued blinkers in the form of a pre-existing text prepared by the UN Economic and Social Commission for Asia and the Pacific (ESCAP), and tamely proceeded to focus on language changes, arguing over full stops and commas. There was little or no discussion on addressing the larger scrounges that hinder successful international negotiations on the environment - such as the control that business and industry has on the positions of governments, and how the negotiations are dictated by economic, rather than ecological, concerns. The result was a series of 'regional initiatives' of an as yet indeterminate nature or function, but a complete lack of concrete solutions to the problems faced in the region. At best, the 'Asia Pacific platform document' is a fairly good, if incomplete, listing of the problems facing the area. Solutions were not discussed and regional priorities were not decided. The document has already been diluted at this early stage of negotiations, due to objections from the industrialised countries in the region (Japan, Australia and New Zealand). Even this early in the process, it already shirks strong action on - or sometimes, even mention of - key developing country concerns. For instance, references to innovative means of funding sustainable development, through means such as 'tobin tax'(imposed on speculative money transactions between countries), bit tax (raised through a miniscule charge on email), or air fuel tax, were thrown out from the final document at the insistence of industrialised countries. Sadly, no lessons were drawn from successful projects in the region, of which there are many. For instance, several successful projects in India have proved beyond doubt the link between successful ecological restoration through community involvement and poverty alleviation. These projects could provide invaluable lessons to the global discussions on poverty, which seem so far to have gone no further than a vague intention to deal with the problem. It looks suspiciously as if the road from the Asia Pacific consultation to WSSD will be an uninspiring process of negotiating text and petty arguments over language that do little to further the goals of sustainable development. Along the way, any hint of innovation will be subject to prolonged negotiations between the developing and developed countries, and most likely end up on the chopping block. The meeting looks set to once again completely miss the larger picture - of the need to establish fair rules to share the Earth's ecological resources equally and sustainably between both the rich and the poor.